"Whereof what's past is prologue; what to come, In yours and my discharge." I've always been excited to upgrade my Autodesk software. I still like to geek out about all the new tools I get to learn. It's like Christmas in spring! Usually, it means taking an afternoon or evening (sometimes both!) installing Product Design Suite, and updating Autodesk Vault. Then the fun with new tools began! But there is always one thing that must be addressed when upgrading to your shiny new release. To make it more interesting, there might also be a grumpy CAD Manager looking over your shoulder, snorting like an agitated thoroughbred. But now with the release of Autodesk Vault 2013, a new capability has been added that should greatly increase the flexibility of migrating to your shiny new version of Vault. Great! What does "forward compatibility" actually mean? What it means is you can upgrade the Vault Server to 2013 in the background, without ever touching the clients. They can access a server running Vault 2013 using the same Vault Explorer and CAD plugins they used for Vault 2012! So what? Why is this a big deal? Just think about the ability to upgrade the server without having to immediately upgrade all your clients. You can stagger your rollout, and upgrade machines clients in stages instead of hitting your CAD department like a whirling dervish! So as you plan on deploying your new Vault versions, take a look at your new choices for deployment. You have more options to make for a smoother transition. And avoid a haircut such as mine (see profile picture)! 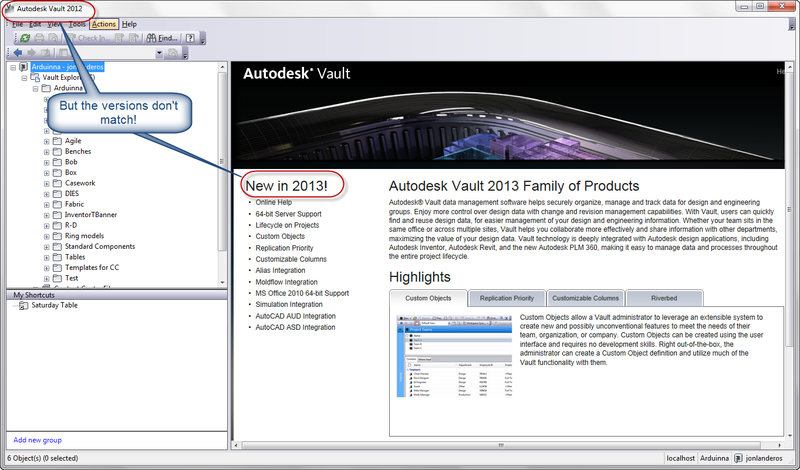 Curious about what else is new in Autodesk Vault 2013? Check out the What's New!